Eliminating gaps and cracks ensures your insulation has maximum effectiveness. Woods Basement Systems, Inc. specializes in identifying the sources of these problems in your home and providing complete air sealing services. We can help you eliminate leaks and make your home more comfortable and efficient. If you're interested in air sealing for your home, call us today at 1-844-204-8198 or click below to get started with a free estimate in O' Fallon, Belleville, Florissant and nearby! When ductwork or air handlers are located in an attic, they have to work much harder to keep your home comfortable. Battling temperatures upwards of 140 degrees F in the summer and as low as 30 degrees F or less in the winter, your attic air handlers need all the help they can get keeping your conditioned air the temperature you want it to be! Air sealing and insulating ductwork and air handlers is a great place to start. Dr. Energy Saver encased this ductwork junction with spray foam insulation to seal any leaks, keeping that conditioned air traveling to where it needs to be---inside your living space! Sealing your ducts is one of the most important things you can do to reduce your heating and air conditioning bills, which account for more than 50% of your overall energy cost at home. Experts put the percentage of air that leaks out of ducts at 40%. A lot of the air doesn't even reach the needed destination, this is why having sealed ducts is very important. Properly venting your bathroom exhaust fan will allow it to work more efficiently. If your bathroom exhaust fan is not vented properly to the outside of the home, the odors and moisture are being blown up into your attic. This can lead to moldy insulation and poor ventilation. Dr. Energy Saver St. Louis can safely vent your bathroom exhaust fans through your home’s roof or one of the gables. Leaky ductwork can be a cause of uncomfortable homes and high utility bills. Often, the majority of air will leak near where the ducts meet the unit or where one piece of duct connects to another piece. Dr. Energy Saver seals these leaky areas with spray foam and/or mastic, preventing leaks. Without these problem areas being sealed, the majority of the air will be lost before arrives at its' intended destination--Your uncomfortable rooms. This O'Fallon,IL home had drafty, too hot/cold, and dusty rooms. Thier floors were very cold. Dr. Energy Saver air sealed the attic to eliminate air penetrations coming through the ceiling. Used baffles to provide attic ventilation. Then blew insulation throughout the attic to give the rooms the proper amount of insulation needed. The rim joist was sprayed with 2 party spray foam to improve thier homes air quality. This Glen Carbon, Illinois homeowner complained about drafts and some rooms being more comfortable than others. Dr. Energy Saver came and air sealed the home and she says she has never been more comfortable in her home. In a properly air-sealed home, your heating and cooling system stops running when your home reaches the temperature set on the thermostat. If your home is leaky, however, it will seem as if your heating and cooling system is constantly cycling. Your conditioned air is leaking through the top plates in your ceiling, and traveling into your unconditioned attic. By sealing these top plates, wires, and penetrations in your ceiling, these unnecessary leaks will be prevented---and ultimately causing your heating and cooling system to cycle less frequently: keeping you more comfortable and also keeping your utility bills lower! This home in Edwardsville,IL needed a more energy efficient home and attic. The rim joist and cantilever was sprayed with 2 part spray foam to seal the air penetrations and create a thermal barrier. The attic was air sealed to seal holes around pipes, wires, drywall, and framing which cause many leaks. These are all sealed up with spray foam. All the holes and top plates are sealed as well. The hot pipes are wrapped to prevent the insulation coming into contact with it, which is a major fire hazard. Covers were put over the can lights and sealed with foam to prevent leaks as well as preventing insulation to be pressed against it which is another fire hazard. Dr. Energy Saver uses a blower door test to measure exactly how much extra air leakage your home has. Besides causing higher heating and cooling costs, which are the biggest part of your overall energy bill, air leaks cause drafts, and places in your house you just can't seem to make comfortable enough to use, and can aggravate allergies as air leaking in brings allergens with it. 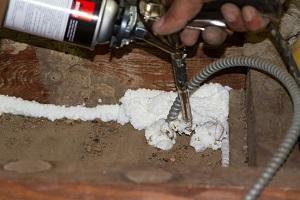 Spray foam is used to seal up all holes and gaps around pipes, wires, drywall and framing. Blown insulation can then be added to achieve a properly air sealed and insulated attic. Lots of air from your ceiling can go around the light bulb in a can light, through holes in the fixture's housing, and into the attic. To prevent this, Dr. Energy Saver St. Louis installed light caps over the can light fixtures in this Collinsville, Illinois attic and sealed them with spray foam to allow insulation to be installed wihout contacting the fixtures and creating a fire hazard. Then, we properly insulated the attic to improve comfort and save energy. Can lights cause homeowners to have higher utility bills and comfort issues. When they are in the uppermost ceiling of your home, they can be the largest source of energy leaks. Dr. Energy Saver St. Louis uses one-part foam to seal all of the holes and gaps found in and around your can light, then encases the fixture with a reflective cover. Now you will be able to keep your conditioned air from leaking into your unconditioned attic space. This Collinsville,IL home had many leaks going up into thier attic. Dr. Energy Saver went in and air sealed the attic. The can lights were air sealed as well with a cover and spray foam. Baffles were put into this attic to keep ventilation throughout it so the roof doens't go bad. Then attic insulation was blown in to get home to its needed level of insulation to have this home comfortable. As much as 40% of an HVAC system's energy consumption can be wasted due to faulty or leaky ducts. Dr. Energy Saver air sealed all leaks in the ductwork running through this Collinsville, Illinois attic to keep cool air from leaking into the attic (or keep hotter attic air from leaking into the ductwork). Eric's home was especially cold during the winter months. He didn't have the proper insulation to keep the heat inside. Once he got spray foam insulation installed he noticed a big difference in the quality of air in his home. Watch this video to learn more about air sealing affects your home's energy efficiency and comfort. Why are air leaks so common in homes throughout the Greater St. Louis area? The answer is simple -- they're built that way. Every joint where walls or floors meet, every screw and nail hole, and every plumbing, electrical, and even HVAC installation has created a gap that allows air to exit or enter the home. Hot air moves from more to less, meaning warm air in your home works its way outside in the winter, while hot air in the summer finds a way in. This means that your HVAC system has to work harder and longer while you deal with uncomfortable rooms. There's almost nothing that the contractors who built and have worked on your home could have done to prevent these small gaps and leaks. However, you can eliminate these issues with air sealing from Woods Basement Systems, Inc..
Attics: More air leaks out of the home through the attic than anywhere else. Warm air naturally rises, and attics are typically under-insulated and full of gaps and cracks. This allows the air you pay to heat to escape the house. Basements: When air leaks out of the house, it is usually replaced by air being sucked in on the lower levels of the home. By air sealing the basement, you can prevent unwanted cold or humid air (depending on the season) from entering the home. Ducts: One of the most important sources of air leaks is actually the ductwork system. Leaky ducts allow conditioned air before it reaches its destination while also pulling in unconditioned air from the attic or basement, depending on where your ducts are. This means your furnace or AC unit has to run longer to get the air to the temperature you want. If you're having problems with uncomfortable rooms and high heating and cooling bills, the home insulation experts at Woods Basement Systems, Inc. are here to help. We can test your home for air leakage problems and provide you with the air sealing services you need. Call us today at 1-844-204-8198 or contact us online for a free estimate in O' Fallon, Belleville, Florissant, Decatur, Ballwin, Belleville, Champaign, St. Peters, Saint Louis and the surrounding areas!